When the Whistler Bike Park opens in just two days on May 2nd, you’ll notice that a few things have changed over the winter. For instance, some of your favourite trails, including Crank It Up and A-Line, have undergone full makeovers. We’ve been assured that everything you love is still there, but that the new shapes and features will provide for smooth rides and a better flow. More on that later. Progression is another area that has received a lot of attention for the 2015 season. From May 2 to October 12, daily orientation sessions will teach beginners the basics of mountain biking, from learning skills to etiquette refreshers. As you read this, crews are up on Whistler Mountain preparing the finishing touches before opening day. 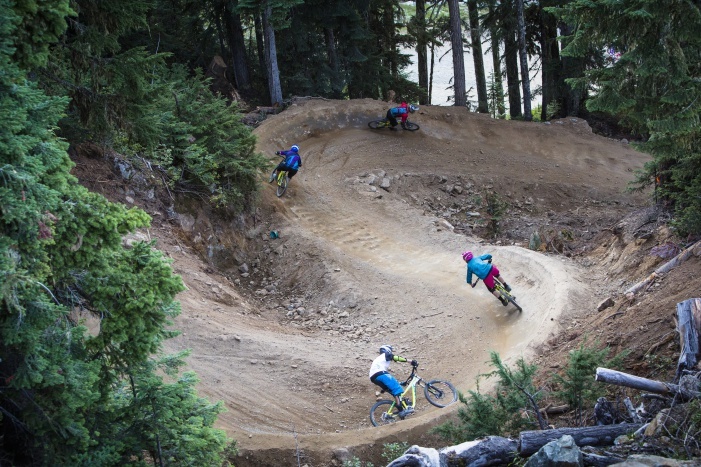 We spoke with Whistler Mountain Bike Park Manager Brian Finestone to get the details on the early opening and what we can expect this coming season. ML: When did you officially decide to bump up the opening date? BF: I can’t even remember now! All I know is that we were sort of looking at it going, should we do this? Can we do this? I guess it was probably a week or so before we officially announced it that we thought, okay, yup, we’re going to try for this thing. ML: Has everything gone according to plan since then, weather wise? BF: No, weather has certainly done the complete opposite of what we had hoped. The warmer, dryer early spring that we had has morphed into wet and unfortunate conditions. These last two weeks have kind of trickled into a colder and wetter pattern. It’s definitely thrown a wrench into our work, but that’s kind of the way we operate. We always expect that kind of thing. ML: Things will still be good to go on Saturday? BF: Yeah, we’re still going to open on Saturday. It will no doubt have affected the trail offering that we put out there. Some stuff that we’d been working on is now saturated because we’ve disturbed the dirt, so it’s going to be way wet. We’ll have to wait for it to dry out over a couple of days. But it looks like forecast for the weekend is good, so if we don’t open it Saturday, then we might get it Sunday. I don’t want to rush the opening of a trail that we’ve worked hard on and sacrifice the quality for the entire summer just to get it open two weeks early. It doesn’t really make sense. ML: Where will be the place to be this weekend? 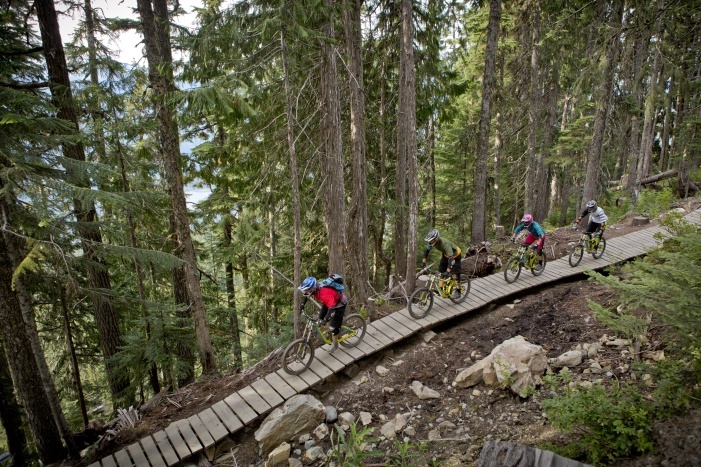 BF: Riding your bike in the Whistler Bike Park! As far as which trails to be on, it’s going to be one of those, like any other biking or ski day, the conditions of the day will dictate the best trails and best conditions. It will certainly be fun regardless. ML: Of all the changes and upgrades, which one are you most excited about? BF: I’m most excited about some of the new shapes that we’ve built on Crank It Up and A-Line. When I look back at the history of building those trails, they were originally hand built or built with a single excavator. Now, we’re using a fleet of excavators working together. We had nine pieces of equipment working in the park last week. We have bigger earth moving equipment and heavier, more powerful machinery. We just couldn’t make a big enough pile of dirt in the early days and now, we can. We can move more dirt over longer distances. It’s much like having snow making in the wintertime; you can build bigger, better, more progressive shaped jumps. They’ll ride that much better. 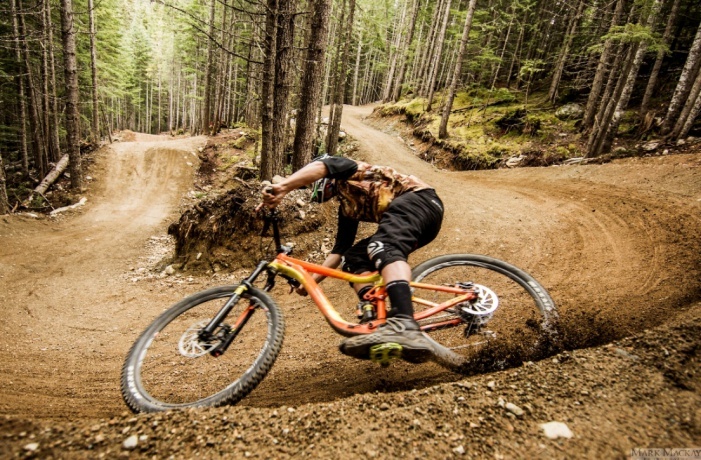 You can keep up with changes, updates, and new features on the Whistler Mountain Bike Park’s Updates page. While you count down the minutes until the bike park opens, you can feast your eyes on this teaser.